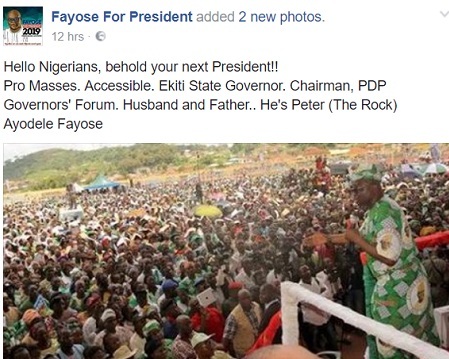 Fayose launches presidential campaign on Facebook, Twitter – Royal Times of Nigeria. The Ekiti State governor, Ayo Fayose, has commenced activities towards his ambition to become president of Nigeria in 2019. On Monday, the governor launched his campaign on Twitter and Facebook by opening accounts in the name his presidential campaign on both platforms. His spokesman, Lere Olayinka, however, told PREMIUM TIMES that the campaign has not been officially launched. Mr. Olayinka said what happened on Monday was the opening of the official Twitter and Facebook accounts on the social media. He said, “When we officially launch the campaign, everyone will know about it,”. Mr. Fayose had recently boasted that he would wrest power from the ruling All Progressives Congress come 2019.